On March 14, 2018, LADOT hosted an open house at the Mar Vista Recreation Center to discuss project updates, present the latest data from the 6-month project evaluation, and receive comments and input heading into the project one-year evaluation. Over 100 community members attended. You can view the display boards here. LADOT provided transponders to the Los Angeles Fire Department that preempt traffic signals so LAFD vehicles can move through the intersections quicker. 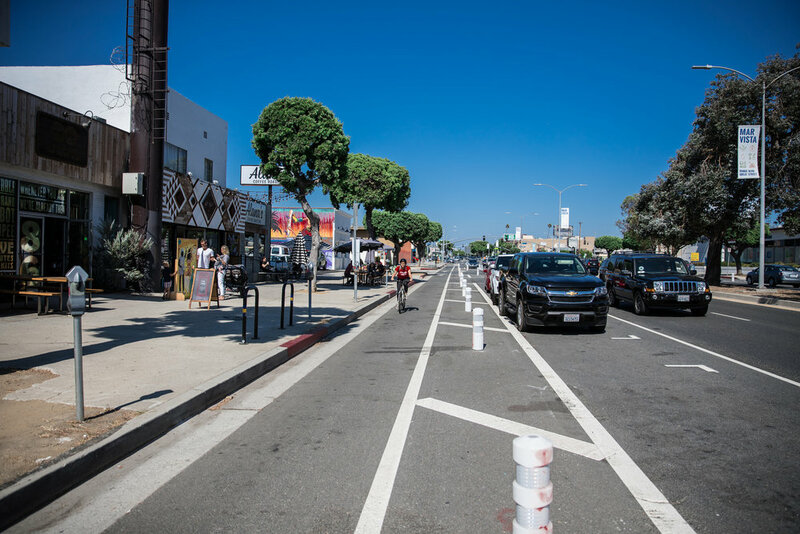 LAFD reports that the preemption made a difference on Venice Boulevard, and data shows they are moving 30 to 40 percent faster than general traffic. LADOT reconfigured the left-turn lanes on Venice Boulevard at Centinela Avenue from one lane to two lanes. This allows more vehicles to make left turns in one signal cycle, which streamlined movement through Venice Boulevard. LADOT improved the safety of right-hand turns at certain intersections. Some intersections received a new right-hand turn configuration and some intersections received modifications that improve visibility. Learn more about the proposed configurations here. The number of collisions and injury collisions occurring on Venice Blvd. continued to decrease three months after the reconfiguration. 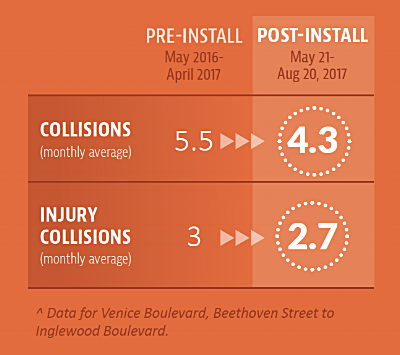 The data reported that the number of drivers speeding along the corridor continues to drop, making downtown Mar Vista a safer and more vibrant neighborhood. Additionally, the three month data showed that trips on the corridor are now within zero to 60 seconds of pre-project times. On July 22, 2017, LADOT hosted a community Open House aimed at communicating key facets of the Mar Vista project after one-month of installation. Over 200 members of the community attended the event and many individuals shared their feedback on the project. Data indicated a drop in the number of drivers speeding above the 40 mph limit, which is crucial because pedestrian collisions involving cars going over 40 mph are almost always fatal. In addition, the latest data shows that trips through Mar Vista’s Venice Blvd. corridor are within 30 to 90 seconds of pre-project times. On July 11, 2017 LADOT and Councilmember Mike Bonin presented project updates and information at the Mar Vista Neighborhood Community Council meeting. Community members provided insights and ideas into the Great Streets Project, and after full consideration of all sides, the Council voted in support of the project. See the data and information we presented at the council meeting here.